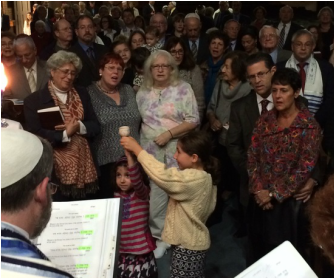 You are welcome to join us for worship services for many major and minor Jewish holidays. Consult the Temple Calendar for the dates and times. Passover (Pesach) is a spring festival, commemorating the Exodus from Egypt. The main observance of Passover is the seder (meaning "order"), a ritual festive meal at which the story of the Exodus is told. During the holiday, Jews are prohibited from eating or owning chametz (leaven) and are required to eat matzah (unleavened bread) at the seder meal. Passover is observed as a seven-day holiday by Reform Jews, and by all Jews in the Land of Israel. Festival services for Passover at Temple Sinai are observed on the mornings of the first and last days of the holiday. Rabbi Jeff on Passover: Passover Food Obsessions, One Seder or Two? Yom HaShoah, also known as Holocaust Remembrance Day, falls in the week following Passover. Shoah, which means catastrophe or utter destruction in Hebrew, refers to the atrocities that were committed against the Jewish people during World War II. This is a memorial day for those who died in the Shoah. Temple Sinai observes an evening ceremony for Yom HaShoah each year to commemorate the victims and the heroes of the Holocaust. Yom HaAtzmaut, Israeli Independence Day, marks the establishment of the modern state of Israel in 1948. It is observed during the week following Yom HaShoah. At Temple Sinai, we observe Yom HaAtzmaut with a service and special events in our Religious School. Lag B'Omer is a festive minor holiday that falls during the seven weeks between Passover and Shavuot (usually in May or June). Lag B'Omer is sometimes called the "Jewish May Day," as it is a celebration of springtime and is often commemorated with bonfires and outdoor games. Shavuot is a major Jewish festival marking the giving of the Torah at Mount Sinai. In ancient times, Shavuot was a pilgrimage festival during which Israelites brought offerings to the Temple in Jerusalem. Traditionally, the holiday is observed with an all-night Torah study, called a Tikkun, to remember the revelation of Sinai. At Temple Sinai, we observe Shavuot as a one-day holiday with our annual Confirmation class service in the evening and a service including Yizkor the following morning. Tishah B'Av is the darkest day of the Jewish year. Traditionally, it is observed as an all-day fast. Tisha B'Av commemorates the destruction of both the First Temple (in 586 B.C.E.) and the Second Temple (in 70 C.E.). It is also a day to remember many tragedies that have struck the Jewish people throughout history. At Temple Sinai, we mark Tisha B'Av with an evening service at which we read the Book of Lamentations and modern poetry that reflects on the brokenness of our world. Rosh HaShanah is the Jewish New Year. It marks the beginning of the Days of Awe, a ten-day period of prayer, self-examination and repentance. Apples and honey are the symbols of the holiday, eaten to signify the wish for a "sweet new year." Rosh Hashanah is observed at Temple Sinai as a one-day holiday with evening and morning services that include the sounding the shofar. Following the morning service, we travel to Goddard Park to observe Tashlich, the ritual casting away of sins by throwing pieces of bread into the water. Yom Kippur is the Jewish Day of Atonement, the holiest day of the year. It is a day dedicated to turning our minds, bodies and souls toward seeking forgiveness from and returning to God. It is the culmination of the Ten Days of Awe during which we seek reconciliation with people we have wronged, acknowledging our sins and the pain we have caused. Yom Kippur is a day-long fast during which we deny ourselves bodily pleasures as we focus instead on our spiritual life. At Temple Sinai, we begin the holiday with the Kol Nidrei service in the evening. During the morning service, we recite the traditional prayers asking forgiveness. The afternoon service includes the Yizkor memorial service and ends at sunset with the final shofar blast that marks the end of Yom Kippur. Sukkot is a major holiday for giving thanks for the fall harvest. It commemorates the 40 years of Jewish wandering in the desert after the giving of the Torah on Mt. Sinai. Sukkot begins five days after Yom Kippur. During the holiday, many Jewish families build a sukkah, a small, temporary booth, and eat their meals there. It is a mitzvah during the holiday to take up the four species of the lulav and etrog in a ritual seeking the fertility of the land. At Temple Sinai, we observe Sukkot as a seven-day holiday, with a festival services on the first and seventh days. Sh'mini Atz﻿eret and SImchat Torah follow immediately after Sukkot. The evening service includes the reading of the very last and the very first verses of the Torah as we begin again the annual cycle of Torah reading. It is a fun-filled evening of rejoicing in the Torah with special honors reserved for the children of the congregation. 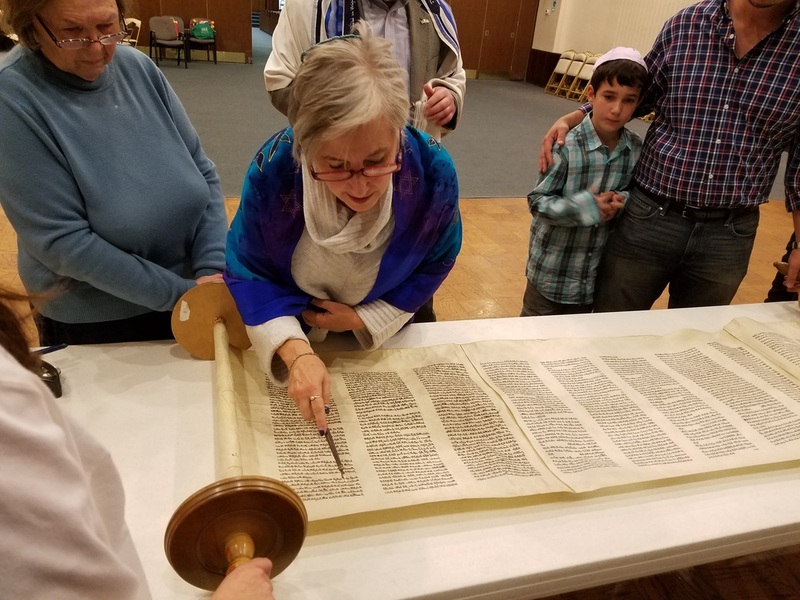 Following the practice of Reform Judaism, Temple Sinai observes Sh'mini Atzeret and Simchat Torah as a single holiday. A Yizkor memorial service is observed in the morning. Chanukah is the joyous eight-day celebration during which Jews commemorate the victory of the Maccabees over the armies of the Seleucid Empire in 165 B.C.E. According to the Talmud, after this liberation the Jews rededicated the Temple and experienced the miracle of the Temple Menorah burning for eight days on only a single small container of oil. Jews celebrate the holiday by lighting the chanukiyah, a special nine-branched candelabra for the holiday. Foods prepared in oil including latkes (potato pancakes) and sufganiyot (jelly donuts) are a special part of the celebration. Temple Sinai has a special candle-lighting service during Chanukah each year. Tu BiShvat is often called the "New Year of the Trees," or a "Jewish Arbor Day." Tu BiShvat is observed as a day for celebrating the Jewish connection to the land of Israel, as a day for environmental awareness, and as a day of mystical awareness of the flow of divine energy from heaven to earth. Many Jews hold a Tu BiShvat seder each year that includes the ritual eating of fruits and nuts from trees. Each year, Temple Sinai observes Tu BiShvat with an evening seder or during Religious School. Purim commemorates the victory of the Jews against a plot to destroy them in ancient Persia, as described in the biblical book of Esther. It is a raucous and joyful holiday, observed with a public reading of the Scroll of Esther (Megilat Esther). The reading of the megilah is often accompanied by a spiel, a humorous retelling of the Purim story with actors playing the parts of the characters in the book. It is traditional to send gifts of food to friends and to make donations to support the poor. 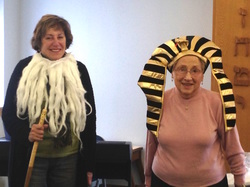 Temple Sinai celebrates Purim each year with a congregational megilah reading and Purim spiel.